President Donald Trump has never made any explicit public endorsement or even acknowledgment of QAnon, the deranged conspiracy theory that imagines there are tens of thousands of sealed indictments that are about to take down a global cabal of satan-worshipping pedophiles. But Trump, through his personal Twitter account @realDonaldTrump, does have a habit of either quote-tweeting or retweeting tweets from accounts that endorse the theory. While none of the tweets Trump has retweeted endorse QAnon, the fact that they come from pro-QAnon accounts has energized members of the QAnon community. 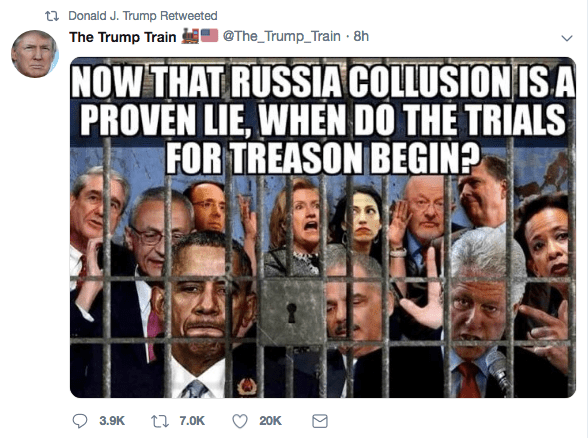 The image touches on a narrative within the baseless QAnon conspiracy theory: that there was a failed coup against President Trump, and those who participated in it will face military tribunals. 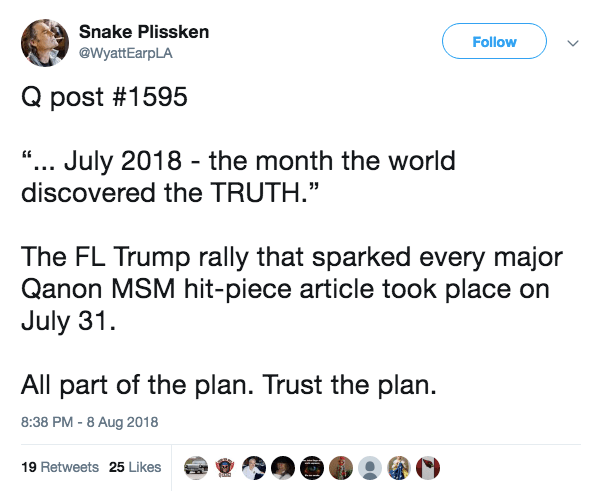 @The_Trump_Train has previously promoted the QAnon conspiracy theory, including using the QAnon hashtag #WWG1WGA. 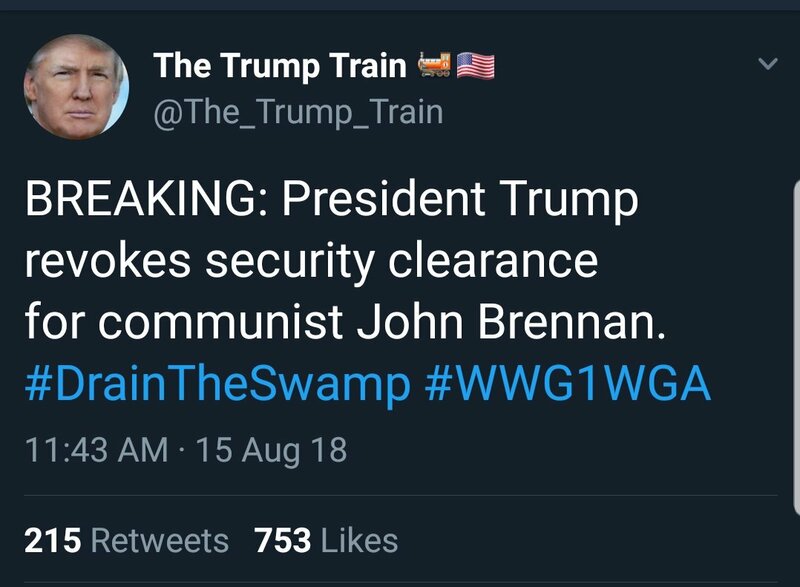 This is not the first time Trump has boosted a pro-QAnon Twitter account. On October 14, Trump quote tweeted @WyattEarpLA. 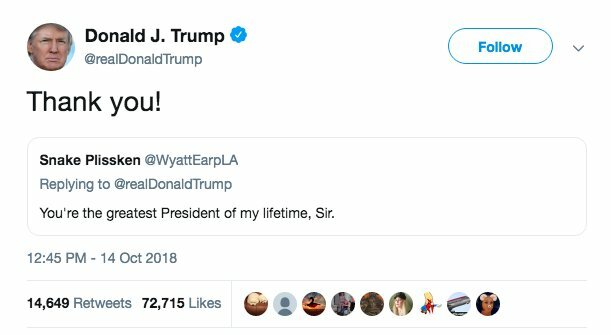 @WyattEarpLA has frequently endorsed QAnon. It has even referenced “Q Drops,” the cryptic posts made by the anonymous 8chan poster known as “Q.” People in the QAnon community baselessly believe that Q is somebody or a group of government insiders close to President Trump. 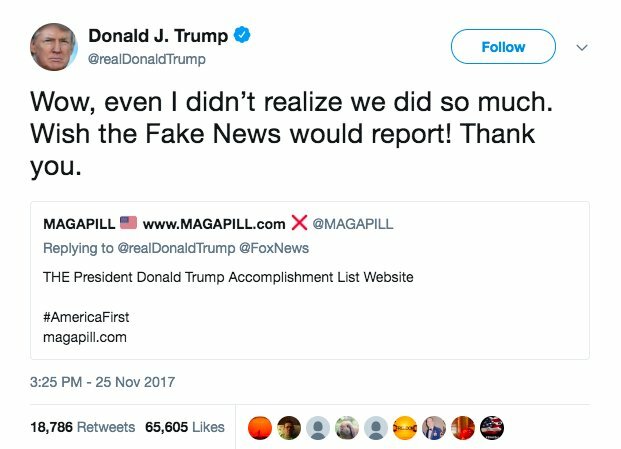 In December 2017, Trump quote tweeted @MAGAPILL, an account that was pro-QAnon at the time. 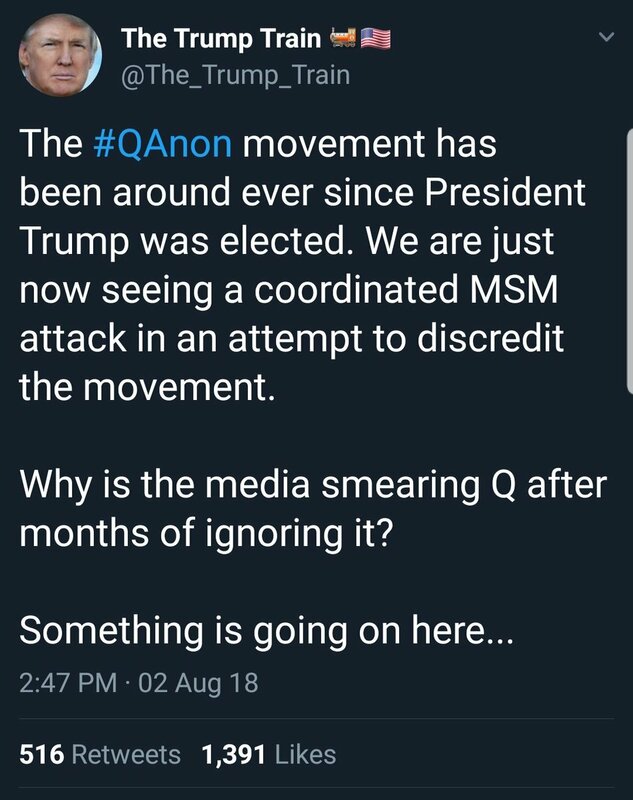 MAGAPILL has since denounced QAnon on the basis that it’s a possible “psy op” that causes division within the pro-Trump community. However, the QAnon community has found these quote tweets and retweets very validating. For example, a pro-QAnon blog called Trump’s retweeting MAGAPILL a “Q Proof,” or evidence that the baseless QAnon conspiracy theory is legitimate.